It all happens this coming Monday, Oct. 31 at the Jim Ciccone Civic Centre from 6 p.m. to 8 p.m. In one night, a young Rupertite will be able to score on a Rupert Rampage ‘ghoul’-tender, bowl and golf with pumpkins, play eyeball ping-pong toss, and take home a haul of candy to boot. It all happens this coming Monday, Oct. 31 at the Jim Ciccone Civic Centre from 6 p.m. to 8 p.m. available for kids and young adults region-wide, free-of-charge. Even though the 29th Annual Community Hallowe’en Fest costs sponsors and organizers approximately $15,000 to run, the Hallowe’en spirit from volunteers, the Hallowe’en Fest committee directors, Prince Rupert RCMP, Fire and Rescue, service clubs, Save-On Foods, Via Rail, Safeway, Northern Savings Credit Union, the City of Prince Rupert, area small businesses and numerous individual donors make the event possibly the most anticipated of the year for kids in the Prince Rupert area – certainly for their taste buds. “We’re going with all the usual activities,” said director Bev Killbery. “We’ll have the costume parade and we’ll have the raffles for kids and adults and we have all of our events where kids can get their candy from. The Rampage – when they come – ‘Shoot the ghoulie’ is a popular game because every little boy and girl wants to shoot a puck right at their goalie. ‘Pumpkin Bowling’ is very interesting. Same with ‘Pumpkin Golf’. A lot of the older kids like that one. It’s like miniature golf, but it’s a lot easier. 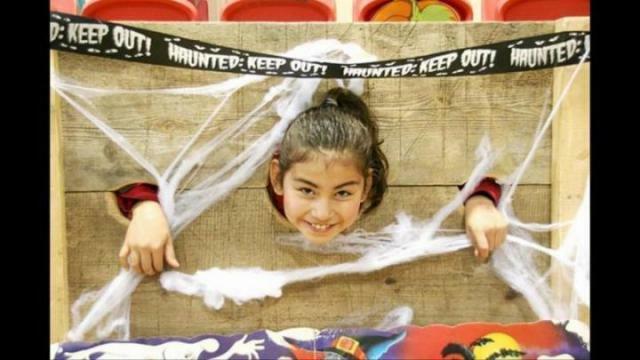 ‘Pin the Nose on the Witch’, ‘Donut Dangle’, ‘Monster Mash’ ‘Mummy Wrap’, ‘Fish Pond’, ‘Guess the Pumpkin Weight’, ‘Angry Birds’ and of course, the costume parade are all mainstays at the creepy, crawly event. Candy is distributed to all children who play the games, and each child who attends will be able to take home a bag of it. This year, they can take home brand new bags, created just for Hallowe’en Fest, which can be brought back during subsequent years, because even ghouls and goblin are environmentally friendly. Kids can also bring their own bags, or as is custom, pillow cases. Organizers are always on the hunt for monetary or candy donations for the event, as a typical year sees them bring in more than $4,000 worth of candy. “We accept candy, but it has to be boxed and individually wrapped, and money is always a good thing,” Killbery said. The candy distribution and the event itself was created for the families who may not want to spend their night in the potentially cold and wet Rupert weather traditionally trick-or-treating, but instead can experience Hallowe’en in a fun, safe environment. “We’re always looking for volunteers. Sometimes we have a lot of kids from Charles Hays [Secondary School] and Pacific Coast School and other years, not as many. But we need adult volunteers to help run the games,” Killbery added. Volunteers are asked to arrive at 6:30 p.m. and leave at 9:30 p.m., or whatever they can manage. A ghostly display of fireworks will cap the evening off at 8:15 p.m. They will be lit at the golf course and are visible from the Jim, its baseball fields and Patullo Field beside Prince Rupert Middle School. “Hopefully the weather holds up. We’re good with fireworks as long as we don’t have too much wind. Rain is not a problem,” she said. The Earl Mah Aquatic Centre is also hosting pool parties with a children’s swim on Sunday, Oct. 30 from 2 p.m. – 4 p.m. for kids 12-and-under and a teen swim on Monday, Oct. 31 from 7 p.m. – 10 p.m. for teens aged 13 – 18-years old. Volunteers not already signed up are asked to contact the GHOST-line at 250-62GHOST (624-4678) or Killbery at 250-622-8684.